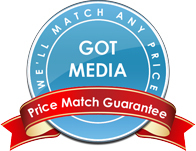 GotMedia.com sells a complete line of CD DVD Inkjet Printers from simple desktop printers to fully automated systems capable of printing thousands of discs. We represent top manufactures such as Epson, Microboards, Primera, Microtech, MF Digital, Teac and Rimage. We sell only the best and we are constantly updating our site with the best CD DVD inkjet printers on the market, so if you would like assistance in choosing the right CD DVD inkjet printer for your specific needs, don't hesitate to call one of our knowledgeable representatives at 1-866-409-1090.